I can definitely relate! As I get older, comfort sure means a lot to me…and it takes a little more for me to be comfortable. I have gone from sleeping on the floor when I was younger, in a small tent, to loving a larger tent that I can put a raised air mattress in that also gives me plenty of room to move around and be able to stand straight up. It is a pleasure not to have to get dressed in my tent all hunched over or on the floor. As you know, tents come in all different price ranges. There is ultra cheap which will do the job for a short period of time, to the very pricey top of the line camping minimalists choices. Like you, we normally choose tents that are good quality and in the midrange price-wise. We do go camping at least once a month, nine to ten months out of the year, sometimes even more than that. When buying a tent you will take into consideration the size and shape, as well as some comfort features. You want to make sure your tent has good ventilation and rain protection, including a rain-fly and a tub-style floor, which means the floor material wraps up the side wall a few inches. Also, when looking at the tent sizes you want to double the manufacturer’s size recommendation. So if you are looking for a tent for you and one partner, you will actually look for a tent that sleeps no less than 4 people, or even 6 people. Finally it is important to make sure you go through a trial run and set up your tent before you go so you know what you are doing...and seam-seal your tent before you go as well. Many tents today come with a bottle of seam sealer, or it is very inexpensive to purchase. Our two favorite brands are the Coleman tent and Eureka tent. Both are quality well-made tents for the “occasional” camper, that are very reasonably priced. Between Coleman and Eureka, the Coleman tent is the lower end, but still gives you a lot for your money. For comfort you may want to consider splurging on a larger cabin tent such as the Coleman WeatherMaster , which gives you plenty of room to store your gear, to put a bed, and to stand up in, as well as a screen room to relax outdoors on those buggy nights. This is similar to what my husband and I use currently for just the two of us. Keep in mind though that the cabin tents, while roomy, do tend to be heavier and a little more to put together….so if that seems too much for you, you may want to take a look at the Coleman Sundome tents . These come in several different sizes and you should be able to find one that is the perfect size for you. The lighted Sundome Tent is roomy, has a built-in light in the ceiling with a remote, and will give you room to stand up at full height. The Eureka tent seems to be a little higher in quality and higher in price, but is still a very affordable tent. Eureka also makes cabin tents and dome-shaped tents as well. We are personally looking at the Eureka Copper Canyon for our next tent as again, we like a large cabin tent. 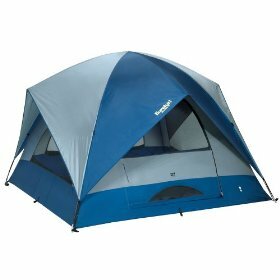 My teenage son has a Eureka Timberline 4-Person Tent for himself, a comfortable tent and very easy to put up but it is an A-frame style tent. You will be able to stand up in the Timberline 6-Person Tent , but not the 4-person tent. Two other Eureka recommendations are the Eureka N!ergy 9 Five-Person Family Tent This tent is a 4-5 person (per Eureka recommendations) dome-shaped tent that you will be able to stand up in as well. And finally the Eureka Sunrise 9 4-Person Family Tent . Another dome-shaped tent, this one is more traditional and does not have all of the "electrical" options but does get rave reviews for its ease of set-up. I know how confusing it can be to look at all of these different tents and try to make a choice! You still have to make a decision, but I hope I have helped you to be able to narrow it down some. If you have any more questions, feel free to contact me again and ask! Thanks so much for asking Jackie…and Happy Camping! Your tent selection should consider your physical abilities as well as your financial. 1. Are you able to crawl into a tent, or should you be able to walk in? A smaller tent will have lower headroom. A cabin style with vertical side walls may have more center headroom for a given width than a dome style claiming the same sleeping capacity. For a realistic estimate of adult sleeping capacity, de-rate a dome tent's claim by 2-3 persons, a cabin style by 1-2 persons. 2. Can you lift a load of 25# above your head at full extension? The design of some larger dome tents (Eureka Sunrise 11) may utilize long cross poles, making it difficult for one person to erect under any conditions, and very hard to install the rain fly when windy. Some tents have flexible rain flies that drape over the tents cross poles and can be hooked in lace by one person. 3. How far can you reach? A large/square footprint tent may be too deep for you to each the center roof attachment point for hooking it to the cross poles, or for hanging a lantern. 4. Will you be able to sleep on the ground, or need to use a cot? A vertical wall /cabin style tent will provide more sleeping space with cots than a dome style. 5. What is the minimum number of able-bodied helpers you will have to assist in carrying, erecting, and packing the tent? The larger the tent, the heavier it will be. If it must be packed wet, it may weight 2-3x its dry weight. 6. How often will you be using the tent, and in what kinds of conditions? If you only use it once a year during dry conditions, a one season tent can be affordable, but without extra care in handling, it may not hold up for more than one year. As the prices go up, what you get for the extra money are better quality and durability in materials, design and workmanship. Features like built-in lighting are expensive gadgets that deteriorate quickly and are difficult to repair/replace. Three-season features like wind and rain resistance, anti-condensation ventilation during all kinds of weather, urethane-coated tub-style floors, double-taped seams, full-coverage rain flies and storm flaps, polyester vs nylon bodies and high quality screening and zippers start paying for themselves after the second year or 5-10 uses, whichever comes first. Join in and write your own page! It's easy to do. How? Simply click here to return to Ask Camping Jewel.